Last month, ex-Red Jamie Redknapp hailed Andre Ayew - a long-time Liverpool target - for his immediate impact at Swansea City. In the past, Ayew has made it clear many times that he wants to play for LFC, yet despite his availability this summer, the Reds seemingly decided against pursuing a deal. Was this a mistake, or was Rodgers right to ignore the Ghanaian international? "Swansea fans will be delighted with Andre Ayew. He already looks like he has been at the club forever. He [is] instantly comfortable with the pace of the game, his work rate [is] superb and he's shown some good skill". * Jun 2013: He told Telefoot: "I am Ghanaian and an English speaker, and I have a strong preference for England. As for Liverpool - I followed them as a child". 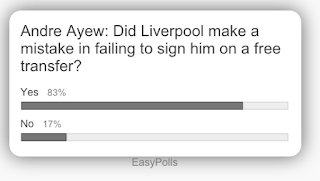 * Feb 2015: Ayew enthused: “All my life I have been a Liverpool fan. It would be an honour play there". * Apr 2015: He told reporters: "I've supported them [Liverpool] for 20 years. My dream is to play in the Premier League, but it's true that I'm a Liverpool fan". 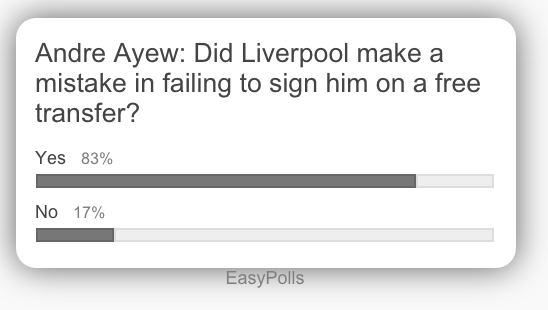 I'd happily swap Ayew for Milner - who also arrived on a free - or Lallana. Those two have contributed ZERO goals/assists so far this season, and in Lallana's case, he's contributed just ONE goal in the last 21 hours of football. Ayew, on the other hand, has hit the ground running 4 goals/assists in his first 5 league games for Swansea. Why is it that Ayew can score two goals in two games in his first week in the Premier League, but Lallana - who has copious Premier League experience - can't score more than two goals in 8 months for Liverpool? It's early days yet, but Liverpool may have missed out on a massive transfer bargain. If the Reds had even looked in Ayew's direction he probably would've signed for the club, and it's a shame that another experienced international attacker has fallen by the wayside. Don't worry, though. If Ayew - hailed by Ghana boss Kwesi Appiah as 'a player of world-class technical ability - has a great season for Swansea, Liverpool will probably sign him next summer for £20m.